There are several ways to enjoy mountain biking in Mammoth. We have a vast network of trails through the mountains, flat trails and of course the Mammoth Mountain Bike Park. Riding your bike is one the best ways to see the glorious scenery of Mammoth. The vast network of Mammoth trails within the Inyo National Forest offers the mountain biker an almost unlimited number of environments and views to discover. The crisp autumn air, sunshine, uncrowded conditions and brilliant fall foliage makes for an unbeatable combination. As the temperatures warm up and the snow begins to melt during the spring months of May and June, enjoy mountain biking on one of our freshly thawed trails. Tour the sites as the winter snows melt into a glorious blend of rushing streams and alpine lakes. During the summer months, the ski slopes are transformed into the # 10 rated challenging Mammoth Mountain Bike Park. There are trails for all ability levels of riders. They offer more than 80 miles of groomed single-track trails and the ski lifts and gondola will transport you and your bike to the 11,053-foot summit for the ride of a lifetime. 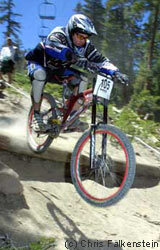 The Mammoth Mountain Bike Park is popular all during the summer months when various bike events come to town. 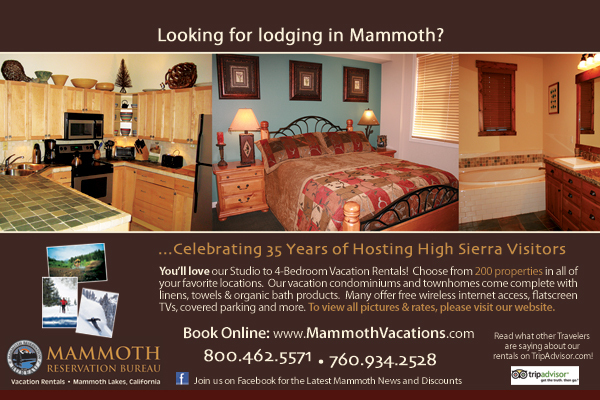 Especially during event season, you will want to secure your Mammoth condo rentals with as much advance notice, so you can get a place right next to the Canyon Lodge park exit. This will give you the opportunity to ride home rather than drive. Most folks will cruise downhill from Canyon Lodge to their rental, or all the way to the Village and then hop the bus to the top of the park.. or home. Then ride down the trails back to Canyon again making a giant loop. The Mammoth Welcome Center and Ranger Station located at the entrance to town on State Highway 203 offers free mountain biking trail maps and information on route descriptions, trail ethics and precautions. The trails in and around Mammoth are rated for difficulty, terrain, mileage, and some with altitude. While the Mammoth Mountain Bike Park (rated #10 in the US)provides miles of single and double track or freestyle trails, there are 100s of miles of ungroomed and natural mountain bike trails throughout the area. These are some of the more popular mountain bike trails. Not into the grind of the hills? There are several scenic loops where you can put in your miles without having to be devastated by our elevation. A very popular ride is the Mammoth Scenic Loop which starts just north of The Village and cruises through the forest. You can even ride up to June Lake through the trees by following the snowmobile trails. You should map it first with the Forest Ranger.